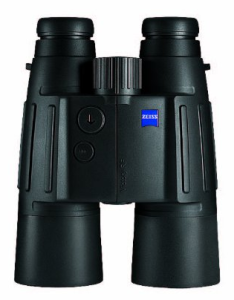 The Carl Zeiss Optical Inc Victory 10X56 Rangefinder Binoculars are like no other! I could not believe the clarity I was seeing with when I first tried them out after getting them. The brightness of the view through the lenses was like I was looking with my own two eyes, just magnified and crisper! These binoculars are made with premium optics, and the images I saw were as clear as day, if not clearer! Due to the fluoride and special, multi-layer glass, it was not even hard to see my targets right before it was completely dark outside. There is a coating on the lenses, LotuTec®, that allows the images to be so vivid and superior. There is no way that I can blame missing a shot on not being able to see it clearly again. One of the features that I was absolutely ecstatic over was the laser technology that is used in these binoculars. I have never used a pair of binoculars that had this type of technology before. The laser rangefinder (as I found out it is called), enables me to measure up distance so easily and quickly. The laser takes out all of the guess work that I was so unsure about before. Again, this is another reason these binoculars are superior to any other I have ever used; the laser lets you see more efficiently when the lighting is something to be desired. Sometimes when I am out in the field or the woods, there are real small targets, like squirrels and rabbits for example, that can be so hard to shoot at. These binoculars help me to aim correctly. I have to make mention of the unwavering steadiness of this product. The laser is so accurate, that even in the most unsteady or shaky of conditions, I am able to keep a steady aim. I remember before these binoculars, it would be such a task to hold my stone age, no bells and whistles binoculars, and try to get a good shot. With the reliable laser system in these though, I am able to have a more accurate shot every time. When I go to the mountains and go hunting, the rocks can sometimes prove to be a bit of a problem for me. When I think I have a good shot, I often find myself precariously placed on top of one rock or another. Of course these rocks are not stable, so I sometimes shift in position. That is a real good example of what I mean about how the laser stays steady, even through unsteady times. I would be the first one to say that I just do not know how to “play nice” with my belongings. I am the first one to drop something, or to mistakenly smash it into the wall or some other surface. These binoculars have unfortunately taken a fall down to the ground more times than I would be willing to say. Every time they fall, I think to myself that I am going to have to be off to buy another pair. That is not the case though, they are resilient! Another factor I am thoroughly pleased and quite impressed with, is the ease of cleaning the actual lenses. It must have something to do with that special coating I read about that is put on the lenses. They are a dream to simply wipe off dirt and water or smudges with just a soft cloth and some water. I would enthusiastically recommend these binoculars!